The Big Swim from Palm Beach to Whale Beach is arguably the premier event on the ocean swim calendar. It is also the last leg of the Pittwater Ocean Swim Series, and understandably so with its popularity growing exponentially from year-to-year. The beach-to-beach swim started in 1974 with just shy of 40 competitors; today, it is pushing 2000 competitors. If you’ve been following the Pittwater Ocean Swim Series, it’s a magnificent way to wrap up the series and finish up your tour of Sydney’s Northern Beaches. The Big Swim from Palm Beach to Whale Beach is the fifth and final part of the Pittwater Ocean Swim Series. The five swims in the series are held across five different parts of Sydney’s Northern Beaches: Bilgola, Newport, Avalon, Mona Vale, and the Big Swim from Palm to Whale Beach. If you manage to complete three of these five, you go into a random draw for a chance to win a weekend in Byron Bay. But that shouldn’t be the only thing to entice you to tackle the Big Swim from Palm Beach to Whale Beach and the rest of the Pittwater Ocean Swim Series. The entire series is a brilliant excuse to take in the beauty of five of Sydney’s Northern Beaches. The Big Swim from Palm Beach to Whale Beach can be one of the toughest on the ocean swimming calendar depending on the conditions. The 2.5km course starts from the Palm Beach Pavilion and finishes right in the middle of Whale Beach. It runs out from Palm Beach, parallel to the coastline, around Little Head and into the centre of Whale Beach. At its worst, swimmers can face a very strong swell and a rough chop. At its best, the Big Swim from Palm Beach to Whale Beach can be a leisurely swim with calm, flat surf. On average, elite swimmers finish the course in around half an hour, while the general average time is around 50 minutes. But either way, finishing will get you one step closer to winning a weekend in Byron Bay, but more on that later. 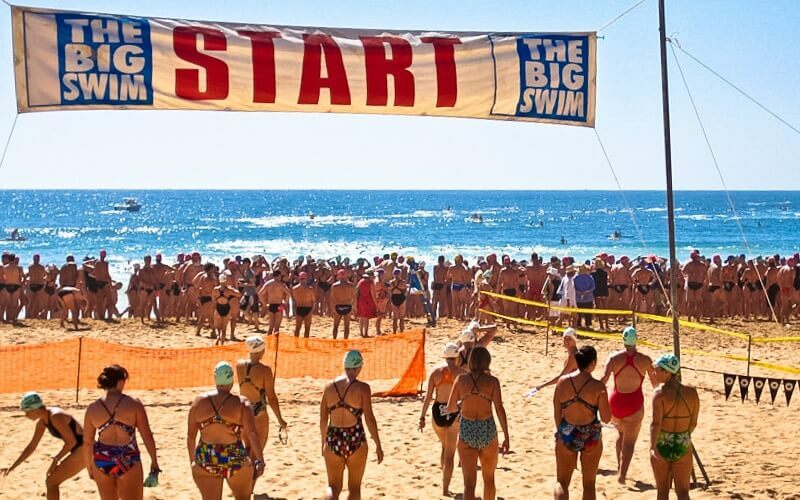 The Little Big Swim is an event for those who want to be part of the festivities, but aren’t yet confident of their abilities to take part in the Big Swim from Palm Beach to Whale Beach. The Little Big Swim will be close to a 1km swim, with a limit of 400 swimmers to ensure comfortable swimming conditions. The course is a beach start, out past the break, and around four coloured buoys before coming back to the starting point. The Little Big Swim is a great way to build your confidence into taking on the Big Swim next year. A straight swim out through the surf, around a buoy 200 metres from the beach, and back to the beach, with a sprint up the beach to finish. Entry is free and only swimmers who complete The Big Swim are eligible. The Little Big Swim course is a beach start, out past the break, and around four coloured buoys before coming back to the starting point. There is a limit of 400 swimmers to ensure comfortable swimming conditions. The 2.5km course starts from the Palm Beach Pavilion, running out and parallel to the coastline, around Little Head and into the centre of Whale Beach. If you’ve just completed the big swim then you’re probably not in the mood for anything too extraneous, but that’s ok, because you can spend the rest of the day living like the other half do. Try popular eateries such as Jonah’s, Dunes Restaurant and The Boathouse Palm Beach. There are a number of clubs, cafes and takeaway restaurants that offer more casual, lower-cost options. Got plenty of time? Why not take in 9-holes at the Palm Beach Golf Course or join one of the local tour companies on a guided tour and visit locations featured in the popular TV series Home and Away. Oh man, parking for this event can be tortuous. Finding a park in Palm Beach or Whale Beach at any time during the summer can be a mission, but with the event on, space is at a premium. So what can you do? Well, one of the benefits of the event having been run for so many years is that the clubs have an awesome bus service to shuttle you from one beach to the other. Start by carpooling as much as possible, then get there super early and park at Whale Beach (the finish). The streets are narrow, and you may need to park a while away, but the stretch will be good for you after the long trip up the northern beaches. Once you’ve parked up, you can walk the scenic road to Palm Beach or catch the shuttle bus. If you do park at Palm Beach, you can catch the bus back the other way at the end.